Nearly half of Virginia’s projected growth in 2020 (392,989 out of the 810,488 increase) is in Northern Virginia, continuing the pattern from the past decade. Northern Virginia will remain the fastest growing region, but the growth rate is expected to decline in the future. We’ll still see big changes there, of course – when you’re starting with such a big population, even a small growth rate produces a big increase in population – so Northern Virginia, will continue to gain in the share of the state’s population, from 32% in 2010, to 34% in 2020 and 36% in 2040. The following map shows the projected 2010-2020 growth rate by locality. The pattern of projected growth rate in 2020 is similar to the growth rate in 2010 – it would be curious if it were not – but while 22 localities experienced growth rates of more than 20% between 2000 and 2010, only 7 localities are projected to maintain growth rates of more than 20% in 2020 (Chesterfield County , Frederick County, James City County, Loudon, Prince William, Spotsylvania County, and Stafford County). Areas with older populations and more out-migration – in the Southwest and Southside regions – are projected to experience continued low or stagnant growth in the next decade. 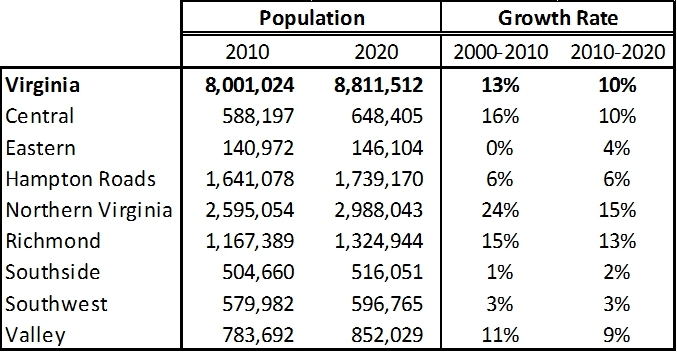 For more on Virginia population projections, visit our projections page.